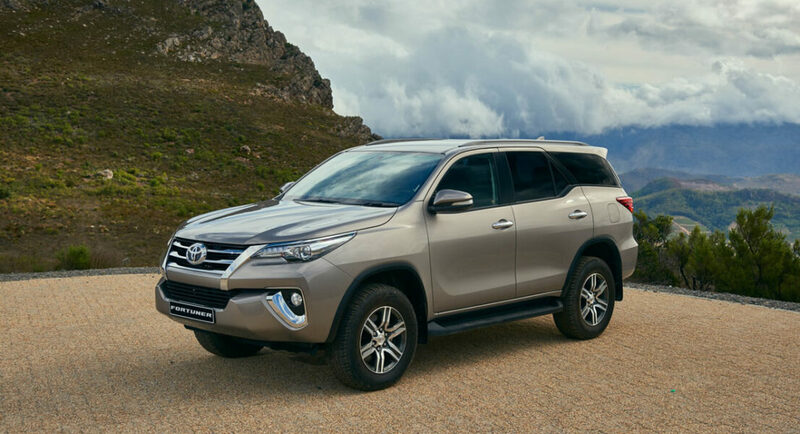 Make no mistake, the new Fortuner is not a mid-cycle update or facelift, it is entirely new and like the first Hilux Surf, and previous generation Fortuner, the all-new model shares strong ties to its sibling, the Toyota Hilux. However, it is far more than just a bakkie-based SUV. 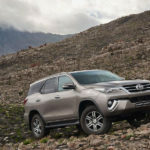 For many consumers, if you asked them to think of one vehicle which best represents the term Sports Utility Vehicle (SUV), their answer will simply be, the Toyota Fortuner. Such is its popularity in this segment and influence over buying decisions, this bakkie-based people carrier – built at Toyota South’s plant outside Durban and exported around the world – has become the default choice, and indeed come to represent an entire segment. Two decades later, in 2005 a far more refined design with similar underpinnings to the Hilux Surf was introduced as the Toyota Fortuner to more than 110 markets. 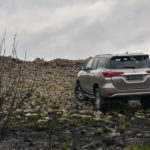 The first-generation Fortuner was launched in 2006 in South Africa and soon became the SUV of choice for bush and urban lifestyle enthusiasts alike. 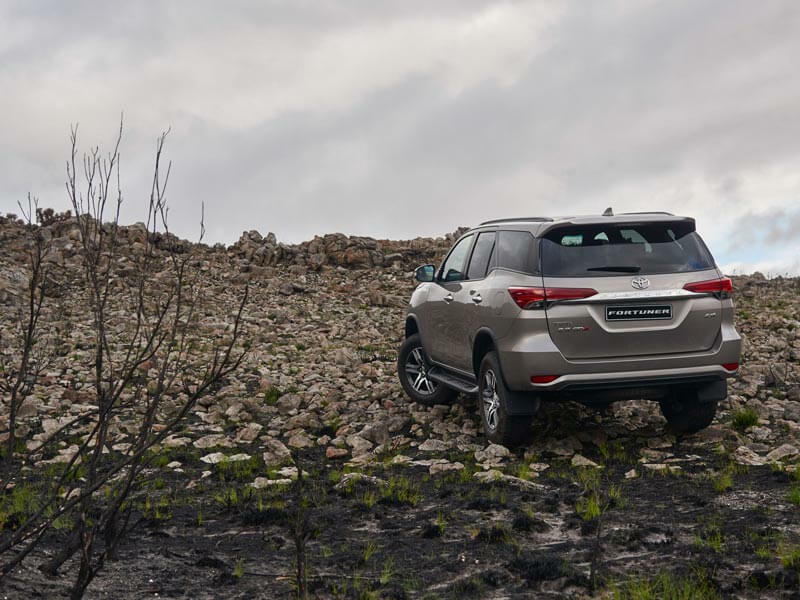 Much like the Hilux, the Fortuner’s design is evolutionary rather than revolutionary. Of course, it would’ve been disingenuous for Toyota to risk alienating loyal buyers with a risky ‘out there’ design, and so new Fortuner is instantly, and easily recognisable as a Fortuner with only hints of Hilux up front in the grille and bumper. It’s worth noting that all models have LED stop and tail lamps, with bi-halogen headlamps standard on the 2.4 Global Diesel (GD) and 2.7 VVT-i, and high-beam LED headlamps on the 2.8 GD and 4.0 V6. 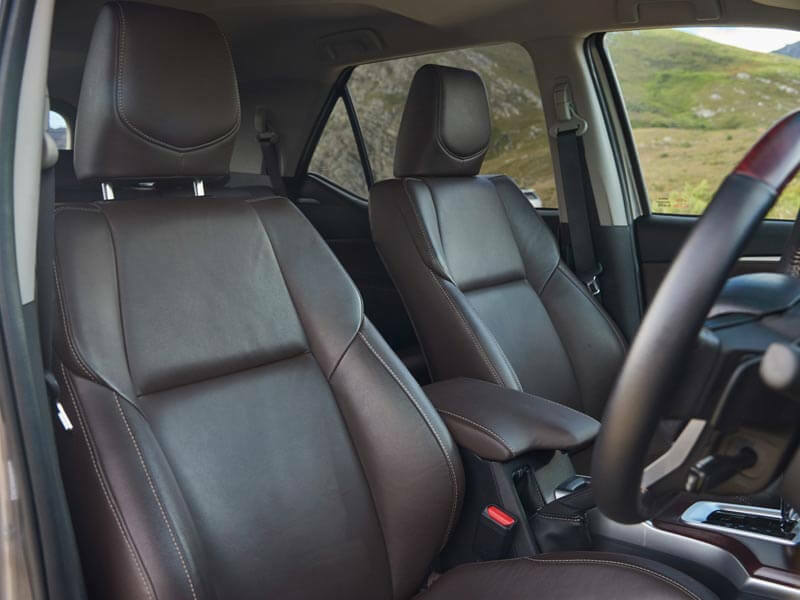 The Fortuner’s all-new interior is a particular highlight considering the previous generations ageing interior. Where the previous model could be called out for a slightly underwhelming and utilitarian interior, the new model is light years ahead offering premium soft-touch materials in key areas around the dashboard, windscreen pillars and door trims, complemented by metallic accents, and woodgrain detail. As before, seating is comfortably for seven with the second row split 60/40 with slide and backrest recline functionality. 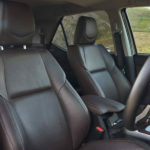 The rearmost third row offers seating for two and is said to be now more spacious and comfortable for larger passengers over longer journeys. Both second and third rows can be stowed away with just one touch to provide ample luggage space. 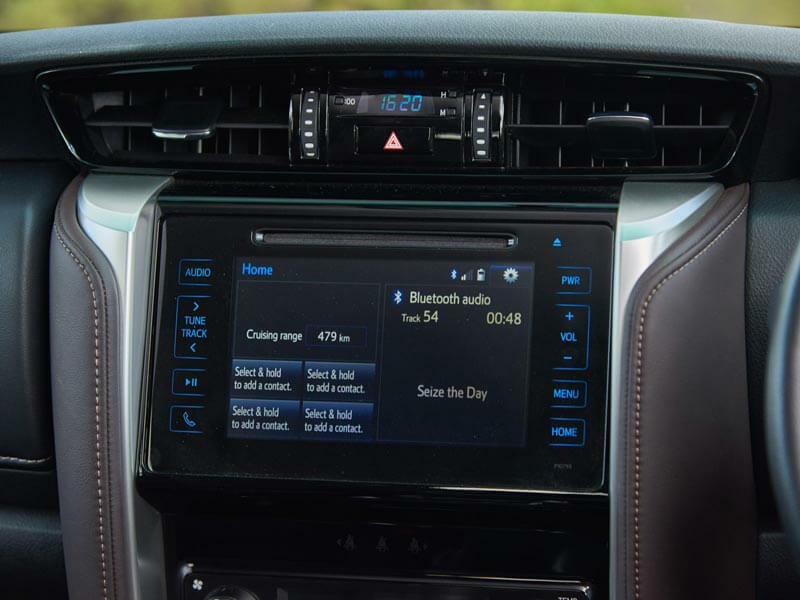 All Fortuner models have audio systems with four to six speakers, an auxiliary/USB port, AM/FM radio and a CD player. 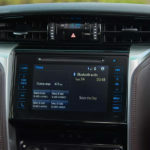 Audio systems on the 2.8 GD and 4.0 V6 models boast a DAB+ digital radio and a 7” screen with DVD compatibility and a reversing camera display. 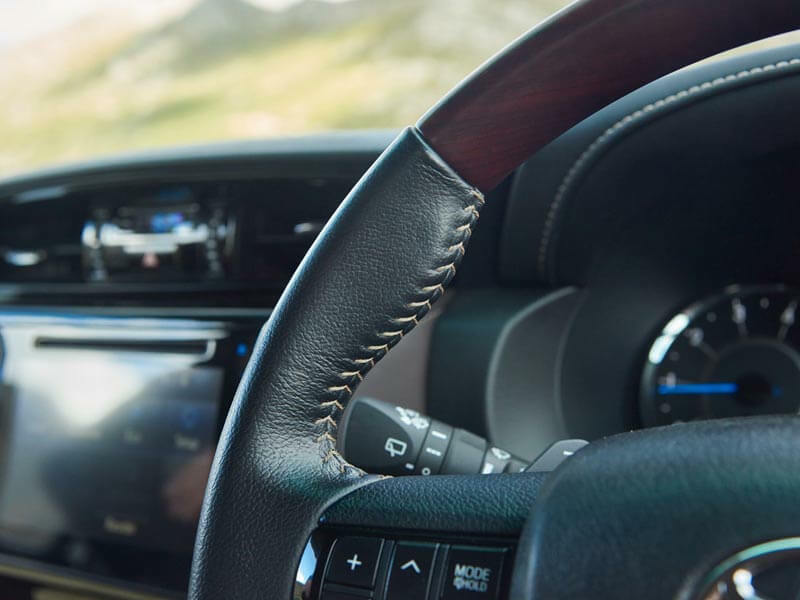 The range-topping 4.0 V6 comes standard with satellite navigation. 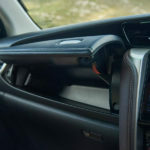 Other convenience features include standard Bluetooth connectivity, steering-wheel audio and telephone controls, as well as power door locks, windows and mirrors. Air conditioning is also standard and features separate air-flow controls for second-row passengers. 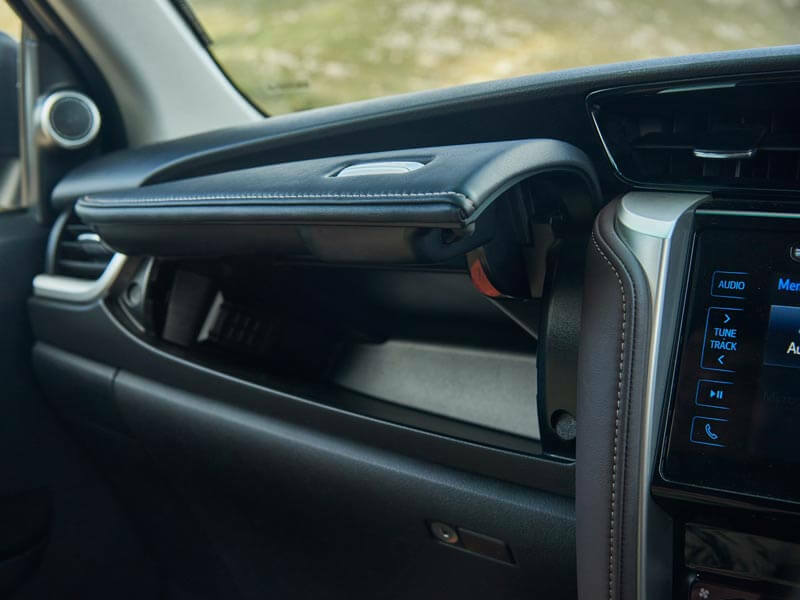 A particular positive for our connected generation is that all models feature three 12-volt accessory sockets – below the centre dashboard, in the rear of the centre console for second-row passengers and the rear luggage area. 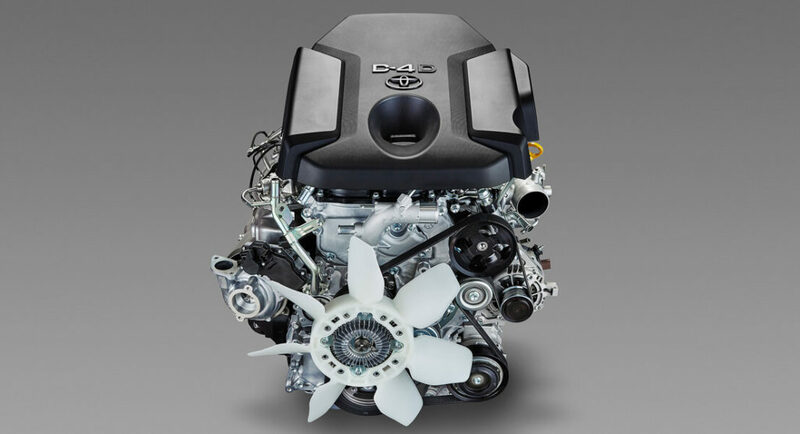 First introduced in the new Hilux, the new diesel engines have been developed from the ground up to offer the best possible combination of power, refinement and economy. Available in 2.4- and 2.8-litre capacities, replacing the previous generation 2.5- and 3.0-litre turbodiesel engines, the new diesel mills are said to be 13% (2.4 GD) and 9-15% (2.8 GD) more efficient over the previous diesel engines. The 2.4 GD produces 110kW @ 3400rpm and delivers 400Nm of torque between 1600 and 2000rpm. While the top-of-the-range 2.8 GD offers owners a stout 130kW and effortless 420Nm from 1600 to 2400rpm in manual guise with automatic transmission versions boost torque output to 450Nm over the same rpm span. Two petrol engines are on offer, including a revised version of the familiar 2.7 litre VVT-i (previously not available locally) which boasts 122kW and 245Nm of torque, and the livelier 4.0 V6 which offers a gutsy 175kW and 376Nm. 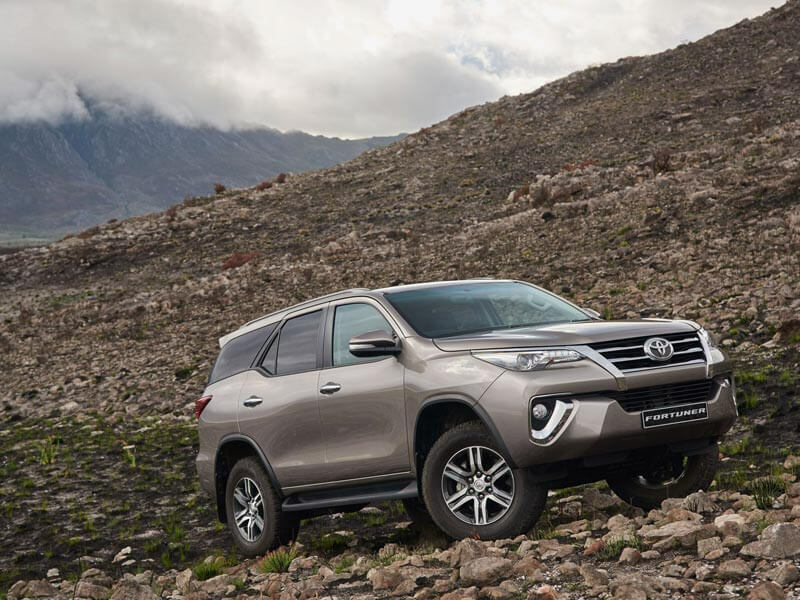 Transmission-wise, the new Fortuner offers the latest Toyota six-speed transmission technology, available in manual or automatic across the entire range, and optimised for performance and economy. 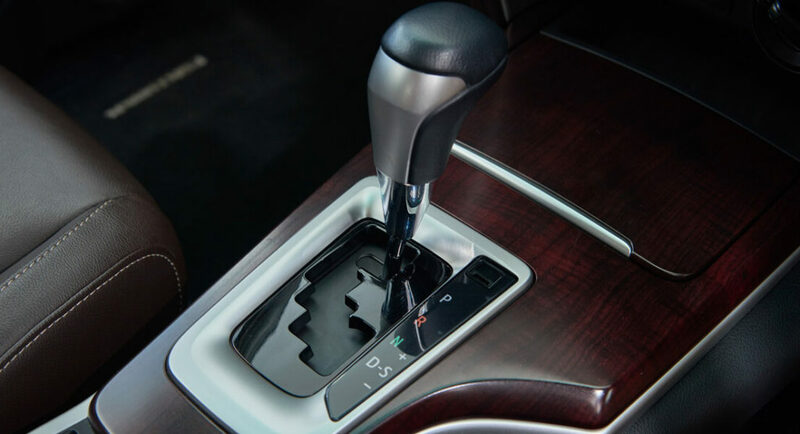 The 2.8 GD receives Toyota’s newly developed intelligent manual transmission (iMT) for smoother shifting on and off road. The iMT electronics match engine revolutions to transmission revolutions for smoother shifts – especially useful when carrying heavy loads. 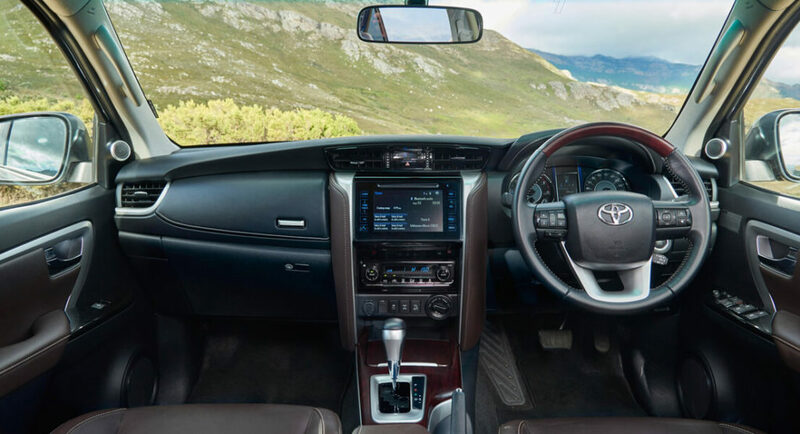 Safety is, of course, top-of-mind and new Toyota Fortuner has been developed to attract the maximum safety standard. A total of seven airbags are included on all models, including a new driver’s knee airbag. Other standard electronic safety features include Vehicle Stability Control (VSC), Active Traction Control (ATC), Trailer Sway Control (TSC), Hill-start Assist Control (HAC) and Drive Mode Select, with Downhill Assist Control (DAC) only available on 4×4 models.